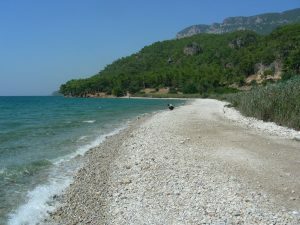 The small town of Akyaka, in south-western Turkey, is situated on the Azmak, the name of a short but deep stream which joins the sea in Akyaka. Formed by mountain springs, it extends approximately two miles from East to West. Due to its depth it has a wealth of underwater fauna. Pefect for scuba diving and the daily boat trips. The water is often icy cold and slightly brackish, the salt coming from the sea across the marsh. Watercress, purslane and celery thrive in Azmak and the restaurants along water use the local produce in many dishes. The word “azmak”, sometimes used to describe a river, literally means “overflow” or “running wild” in Turkish. Possibly in reference to the stream’s strong current. Not usually an issue in the summer but after the winter storms it can become violent. 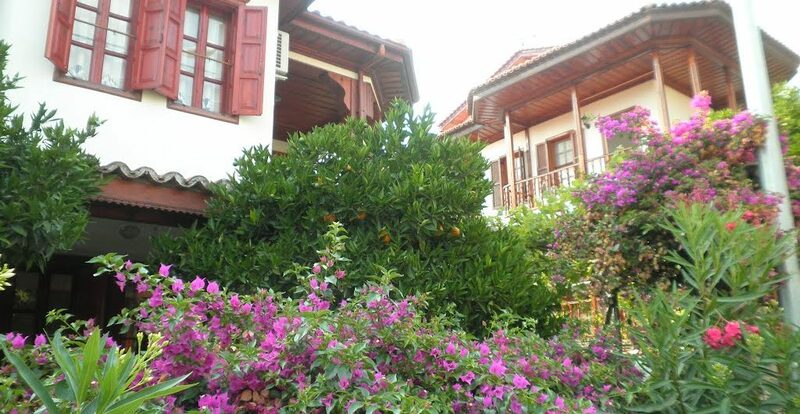 Akyaka’s azmak is also referred to by the fuller name of “Kadın Azmak”. Giving the stream female qualities, make of this what you will! It is difficult to imagine anything disturbing the peace. Ducks and geese jostle for bread, shoals of fish swim past and bright green waterweed waves in the slow-moving water. This small town is not far from some much noisier neighbours: Bodrum and Marmaris, two of the largest resorts in Turkey. Perhaps it was this that prompted the then mayor, Ahmet Çalça, to join the international Cittaslow movement in 2011, making Akyaka the second “slow town” in Turkey. As well as celebrating Akyaka’s slower pace of life, Çalça hoped membership of Cittaslow would help preserve his town’s unique culture, architecture and environment. “Akyaka is my heart,” he said. 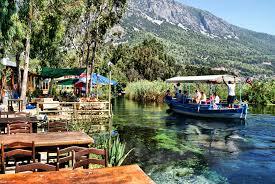 Akyaka is already a favourite destination for holidaying Turks but still relatively unknown to European tourists. The town has a lot to offer foodies, nature lovers and architecture buffs. The river and a wetland conservation area form a picturesque eastern boundary. Protected forests lie to the north and west, with mountains beyond. Upper Akyaka is the working part of town, with a small market, fishmonger, butcher and baker, and coffee houses full of men playing tavla (backgammon). In the 1970s, architect Nail Çakırhan restored the town’s old houses and built new ones in a blend of traditional Ottoman/Turkish/Aegean architecture, which developed into a style unique to Akyaka. The buildings have ornate, pine-timbered eaves and balconies with whitewashed walls and red roofs. Çakırhan won the prestigious Aga Khan award for Islamic architecture in 1983, largely for his work in Akyaka, and today all new buildings must adhere to the same style. As well as its physical charms, Akyaka has a growing reputation for food, based around vegetables and fish. There are a wide choice of boats along the water front. The speciality is, of course, local fresh fish. Not much beats sitting in the sunshine on a boat eating your lunch. If you need to chill out this is the place, and if you tire of fish, there are dozens of restaurants in lower Akyaka which offer more variety. A breath taking view can be seen from the top of the Sakartepe mountain, which dwarfs Akyaka. Up here you can see the whole of the Gokova town and bay. If you get the chance stay for the sunset. The beach can become a little busy in high season but if you walk away from the main boats it never feels crowded. Alternatively try Cinar beach. A stunning setting for the obligatory afternoon ice cream! 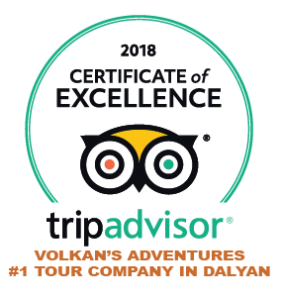 For details on Volkan’s Adventures Slow Town Akyaka Trip from Dalyan please visit here for all details.